It's called Friendly Fenway, people! 2. 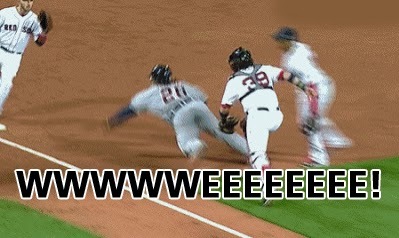 Miggy Be Trippin, Like Whoa - Poor Miggy. His series against the Red Sox left much to be desired, but it was his running (or just plain walking, actually) on the bags that left the best hitter in the game dusting off his pants and ego. Yet, we really shouldn't make fun of Cabrera because, for some guys, doing two things at once is a frickin' death sentence. Right Miggy? 1. Superman, Flying Squirrels and Belly-flops - Someone cue R. Kelly's "I Believe I Can Fly" please. On second thought let's hold off on that request. However, does anyone want to take a guess as to what Prince Fielder was thinking as he tried to take flight back to third base like he was on the runway at Logan airport? I'm assuming he either thought he was Superman exercising his ability to leap building in a single bound, or he found out his spirit animal was a flying squirrel and acted according. Either way it made for one heck of a funny playoff moment. Thanks Prince, we needed that.